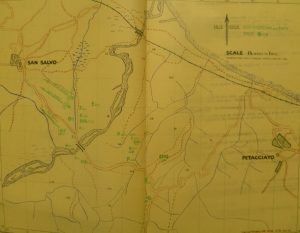 The next obstacle was the River Trigno, about seven thousand yards from Petacciato. On the whole it was shallow, about five feet in its deepest part, with odd sandstone patches in mid-stream. It was wide, with scrub and cover on the south side, and thickly wooded on the opposite side. The main bridge across it was still intact, but the problem whether or not a charge had been laid was not cleared up until the sappers with a platoon from E Company went down and after a short scrap with German rearguards reported that it was safe, so far as they could tell, but a thorough inspection was impossible. An attack went in at once, led by the Royal Irish Fusiliers, and as soon as they reached the bridge it was blown up and a few culverts in the vicinity as well. A small bridgehead was formed by the Faughs and for four days in very bad weather the London Irish waited by the river for the next move. During a temporary break in the clouds they were bombed and strafed by a few F.W. 190s, but not much harm was done. About four thousand yards beyond the Trigno was the small town of San Salvo, which nestled comfortably on the top of a long hill. The London Irish and the Faughs were ordered to take the town, while the 2nd Lancashire Fusiliers were to tackle the railway station by the side of the hill. The attacks were made at night after a preliminary bombardment, but heavy rain made the conditions appalling. From behind the protection of dense minefields the Germans fired into the confined space of the bridgehead. F Company had a bad time. The leading platoon, with 2nd Lieutenant Marmorschtein at their head, was caught between the enemy defence fire and a minefield and had heavy casualties. The platoon tackled a German machine-gun post very bravely, but the platoon commander and most of his men were lost. It was no use going on under those conditions. The Faughs were having a bad time too, and possibly were suffering heavier casualties. They lost their Commanding Officer, Colonel Butler, that quiet little man with an indomitable spirit who was greatly liked throughout the brigade. They had also lost two Company Commanders, Major Paddy Proctor and Major Dennis Dunn, both from the Regiment. The London Irish lost Major Geoffrey Phillips, wounded, and many good chaps, especially non-commissioned officers. The attack had been repulsed and so the two battalions, both badly mauled, got back to the bridgehead. All that very wet day, October 28, the battalion remained on the defensive, frequently shelled by the enemy, who had amassed scores of guns. The attack on San Salvo went in again on the night of November 2—3. This time the Skins were to do it in conjunction with 36 Brigade. 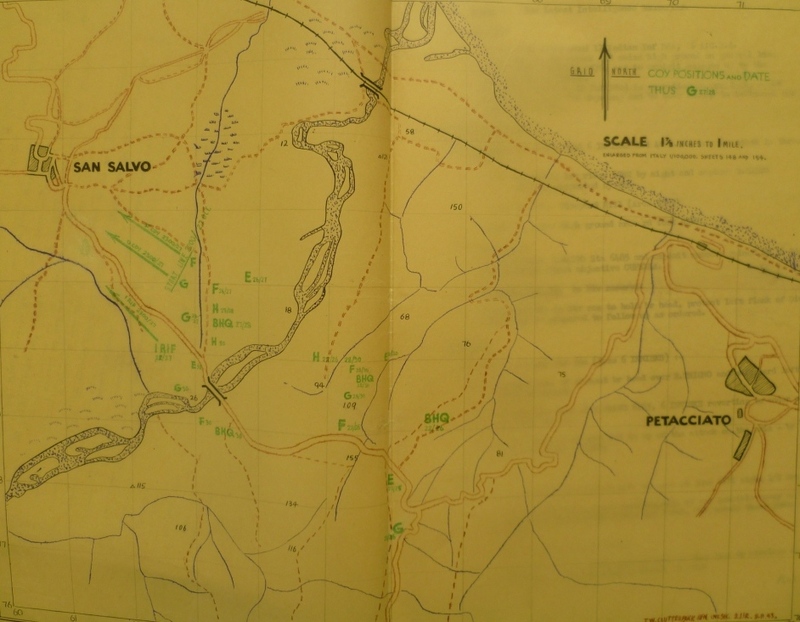 They went in and this time the enemy, faltering under a terrific bombardment, lost ground and San Salvo fell.